All supplementary parts are designed to fit together and the smoke pipes are equipped with slots to lock them together preventing movement caused by temperature changes. Chimney package can be installed up to a height of 3 meters without support in indoor installations (custom built sauna rooms). 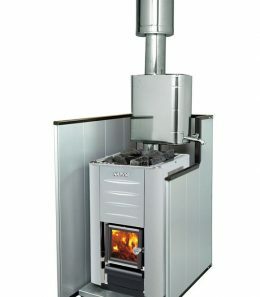 For Ukko Sauna kit packages self-supported chimney installation height is normally about 2 m. The rated maximum temperature of combus­tion gases for a furnace connected to a steel chimney is 600 ºC. 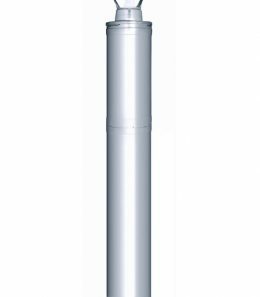 The external diameter of the steel chimney is 220 mm and the diameter of the smoke pipe is 115 mm. 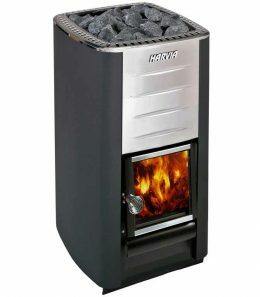 The Harvia M3 series heaters have a classic design and are suitable for small to midium size sauna rooms. 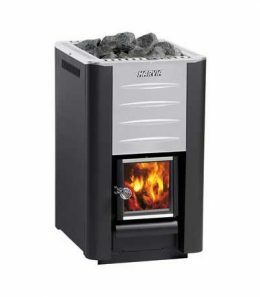 It makes your sauna bath into a pleasurable experience and provides a touch of traditional sauna atmosphere. The even heat and efficient air circulation guarantee an enjoyable bath. 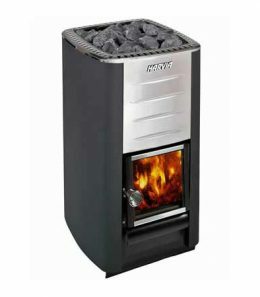 The stove comes equipped with a glass door which provides warm glow of the fire in to the sauna. It has nice graphite black colour and a stainless steel air-flow spoiler.